The Wissahickon Creek joins the Schuylkill River in the City of Philadelphia near the communities of Manayunk and East Falls. The Wissahickon was one of the most heavily industrialized creeks in America. The creek and its impressive valley were home to dozens of mills and factories throughout the 18th and 19th centuries. It was also a favorite subject of artists and writers like Edgar Allen Poe and John Greenleaf Whittier, who visited the rocky hillsides frequently for relaxation and inspiration. The Skippack Valley is one of fewer than 600 National Natural Landmarks in America. 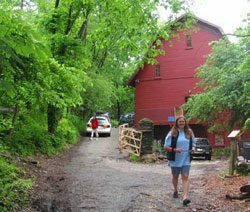 Forbidden Drive is a well traveled biking, walking, and bridle trail that follows the Wissahickon from Manayunk through the Valley. The Valley Green Inn offers exceptional dining in a 19th century roadside inn along Forbidden Drive. There are also a number of environmental education centers in the area including the Wissahickon Environmental Center at the Andorra Natural Area, Schuylkill Center for Environmental Education in Roxborough, and the Riverbend Environmental Education Center in Conshohocken. Away from the creek itself you’ll find the Peter Wentz Farmstead, an 18th-century farmstead with exceptional faux painted interiors that offers a glimpse into the life and livelihood of rural Pennsylvania Germans. Nearby Evansburg State Park is a wonderful fishing and hiking spot along the Skippack Creek. In the County seat of Norristown you’ll find the Norristown Farm Park, and Elmwood Park Zoo, along with the Historical Society of Montgomery County, and Schuylkill River Trail. Perhaps the most popular place to visit in this area is Valley Forge National Historical Park. The site of the Continental Army’s most famous encampment during the winter of 1777-78, Valley Forge is a 3,600-acre oasis of trails and streams, and offers an incredible, up close experience with one of the most defining moments in American history.